...almost immediately I saw this odd cupboard. I went over to take a look and started to get excited! I've been looking for something to organize my fat quarters! When I opened the door, I was instantly sold! I just couldn't believe my luck! The shelves are just wide enough for nicely folded fat quarters and I'll be able to fit lots of them inside as it is 50" tall! I have just enough space left in my tiny studio for it to fit! It's most definitely Shabby Chic - not really Squash House style, but I'll use it as is for now until I figure out a fun way to paint it. 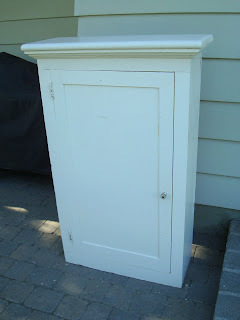 I'm thinking a Primitive Milk Paint - any other suggestions? I went in search of someone to hold it for me while we looked around. Who should I find, but someone from our fly fishing club along with his wife, who were part of the sale! We only know about a dozen people in town and seem to run into them all quite frequently - even this far from home! They live near us, but joined with the farmhouse owners for the sale! It's truly a very small world. Speaking of fly fishing, Mr. Squash and I are flying in to the Minam Lodge for a few days of fishing on Monday. If you haven't read my Minam River Wedding story on the left sidebar, grab a cup of coffee or tea and enjoy the story! We'll be back on Wednesday with what I hope are some really good fish stories! Love your find! I would have swooped it up too. Have a fun fishing trip! Ours have all been very close to home lately because our garden, orchard and cats need us here. What a find! Absolutely perfect for storing fabric. You are going to have fun filling it up. Wonderful addition to any quilter's studio--so glad you snapped it up. I loved your Minam Wedding story so much. Have a great vacation! Great cupboard! I could fill it in no time. Happy fishing and refreshing your memories at the Minam Lodge! A terrific cabinet. I like the thought of milk paint. Have you thought of a color or keep it white? Looking forward to your fish stories. Love your new cabinet! Have a fun time fishing!! Absolutely good find!! Score one for the Squash household..you are definitely a winning team. I love cupboards as they are so useful..Have a great weekend..we had rain both on Thurs. and Fri. and today our sun has disappeared and it is quite cool. okay by me. It'll make a wonderful place for fat quarters. I'm looking forward to seeing what you do with it paint wise. I know you'll come up with something good. going on a second honeymoon? enjoy your time at the river. What an awesome find!! I love finding things like that just when you have the perfect use for it too! Perfect for FQs. You'll have it looking great and fitting right in at the Squash House! 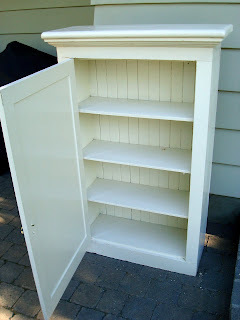 Brilliant cupboard- perfect for fabric- great find!